First of all Rimini is a seaside town. Therefore, the first thing we offer our guests is a spacious and well-organized beach, where quality improves year after year. A sea whose level gradually lowers allowing your children to play safely so that you will not have to worry about them. In addition, you can count on the guarantee of Rimini’s well-prepared lifeguards, that control from their towers and from the sea everything that happens in water, giving you the peace of mind needed to get rid of thoughts and concerns. A wide beach with fine sand where to play and have fun with buckets and spades or relax on a comfortable beach lounger, read a book and chat with friends. Our reference bathing establishment is Bagno Dolcevita N.34, owned and managed by a classic Italian family. Smiling people will carry you to your beach umbrella, offering you a soft Savoia Hotel beach towel. The place is equipped with a bar and a restaurant service (we recommend trying it out at lunchtime), a nice playground for children and beach volleyball courts. We have planned various packages that include the beach service (1 beach umbrella and 2 beach loungers, for example) and a soft beach towel. You can ONLY book them on our website. Have a look at the charming beach of Marina Centro on our LIVE webcam. But Rimini is also vitality, ideas and opportunities. It is a lifestyle that you will see in the eyes of the people you will meet. Getting bored is a word that does not exist in Rimini’s vocabulary. You can choose what to do or not to do. Are you looking for places where to escape, have fun, meet new people or have new relationships? Everything on hand and in a short time. We are the only area in Italy where you can choose between 6 amusement parks such as Aquafan, Mirabilandia, Oltremare, Italia in Miniatura, Acquario di Cattolica and Fiabilandia. Rimini is a town that is changing aspect and it is becoming more and more a place to live and to discover. The many cycle paths allow you to visit the entire city using the bicycles that the hotel puts at your disposal. 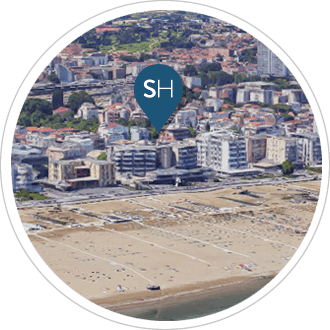 Rimini is a town that also offers hospital services of the highest level and that will give you a full and secure support in case of need (obviously we hope you will not need it). And if it rains what can you do? If it rains the day will never be lost at Savoia Hotel because you can relax in our sea view Spa. Rimini is also culture and passion for cinema. We are proud citizens of the Film Director who won 3 times the Oscar, Federico Fellini, and here you can relive all his greatness, learning about him, if you still did not come across his films. His films are unforgettable, his style and his realism unmistakable: Rimini has finally decided to pay him homage, realizing the Museum Federico Fellini. A traveling museum, consisting of 3 key places, which crosses the centre of the city and allows the tourist to retrace the Majestic existence of the film Director. The project is under construction and all the staff of Hotel Savoia will keep you up to date on the latest news dedicated to Federico Fellini. Rent your bike and start your itinerant path: an unforgettable and absolutely unique experience, that you will not be able to live anywhere else and that only Rimini can offer you. First you will arrive at the number 162 of Corso d’Augusto, at the Movie Theatre Fulgor, reborn thanks to the Oscar prize Dante Ferretti. A dream place, which has been granted a second life, where wood, velvet and precious golden details were chosen to recreate the style of the old American movie theatres. Here you can admire the original drawings of the young Fellini, surrounded by an evocative and exciting atmosphere. The second key place is Castel Sismondo, 15th century fortress: here will be staged a permanent manner and interactive exhibition space dedicated to Fellini and to his cinematographic works, thanks to the use of virtual reality. In this way you will become a part of his sets, reliving live the atmosphere of the cinema of the time. You will be able to understand Fellini and his relationship with the town, admiring the transfiguration lived from Rimini, that become a mythical and immortal place thanks to the film director. The two places are joined by a third key point, which is in reality a place spread. The urban area surrounds them, a redeveloped pedestrian area, capable of offering the best to the tourists who arrive in Rimini. It will be the place dedicated to the playful soul of Fellini, lover of the circus, of the art of game and thoughtlessness. Rimini is finally history and a glorious past. Here you can go back time, reliving the magical atmosphere of the Roman era and touching with your hand the testimonies of an empire unique in its genre, the most powerful in the history of man. Relive the history of Ariminum, the ancient Roman Rimini, and start your path through 6 important places of interest. The Roman Amphitheatre, in via Vezia, is the first point that you encounter in the city. Wanted by Adriano in the II century A.D. is the testimony of works the intended for Rimini to increase its beauty and prestige. The second, which has become a perfect city symbol, is the Arch of Augustus. Erected in 27 B.C. at the behest of the Roman senate, was used as the main door, at the confluence of the important Via Flaminia. Continuing the walk in the glorious history of Rimini you will meet the Surgeon House, built in the middle of the II century A.D.
A building returned in surface in Piazza Luigi Ferrari and identified as the dwelling and the study of an important doctor of the time. Continuing, you will meet the Forum, in Piazza Tre Martiri, and the Town Museum, in Via Luigi Tonini. The first was the heart of the public and economic life of the time, while the second offers splitting images over what was the daily life of the era and hosts an important archaeological section. The Roman route ends with the Tiberius Bridge, 70 meters built in Istria stone, intended as a starting point of the via Emilia and of the via Popilia. An engineering project unique in its kind and still today of inestimable beauty, thanks to the important redevelopment works on all the region that surrounds it. But Rimini is not only Roman domain: it is also an important Renaissance cradle, thanks to the central and fundamental testimony of Sigismondo Malatesta, Lord of Rimini since 1432 and one of the most daring military commanders of Italy. Thanks to him the town became an important fulcrum of the era and a meeting point of many artists and writers. It is his merit if Rimini today hosts two architectural examples of rare beauty: the Malatesta Temple and Castel Sismondo. The first is the result of the transformation of an ancient Romanesque-gothic church, in the middle of 1400. The exterior was worked by the great Leon Battista Alberti, while the renewal of the interior was entrusted to Matteo de' Pasti. While entering you can admire a crucifix by Giotto dated 1312 and a fresco by Piero della Francesca, in which Sigismondo is pictured while kneeling at the feet of his homonymous Saint. Castel Sismondo instead was the residence-fortress of the Malatesta family until 1468. A building intended as a tangible sign of power and supremacy of the city that still retains a profound charm, thanks to its imposing architecture. In the same area, which will soon be closed to traffic and will become a fundamental nucleus of the Federico Fellini Museum, rises Theatre Galli, inaugurated in 1857 on a project by the architect Luigi Poletti and with the premier of Aroldo, directed personally by the immense Giuseppe Verdi. The Theatre lived decades of fervent activity, but was severely damaged during the bombing of the Second World War, which left untouched only the outer facade and the foyer. After a profound work of restructuring, the Theatre will reopen to the public in the coming months. The revaluation of the entire building looks amazing and involves the exterior walls and numerous interior elements: vault, balustrades of theatre boxes, floorings and scenic arc will come back to new life. A very important project for the town, capable of giving a new excellence to Rimini. My family and I felt pampered, the staff friendly and attentive to details, relaxing spa, spacious and clean room, position in front of the sea, the evening so much movida.